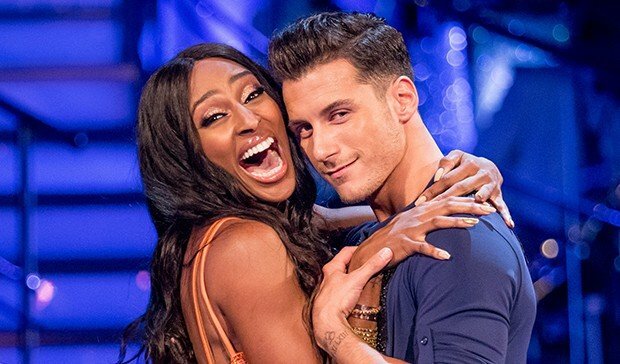 Singer and Strictly Come Dancing contestant Alexandra Burke is reportedly at loggerheads with professional dance partner Gorka Marquez. According to latest reports, the pair are ‘at war’ after Alexandra became furious that his attention isn’t solely on winning the Strictly trophy, but seems to have other things on his mind. Rumour has it that Gorka is in a relationship with fellow contestant Gemma Atkinson – and Alexandra isn’t happy about it in the slightest. Gorka and Gemma have apparently been meeting up after rehearsals and even going out for dinner after the live show on Saturday evenings. Due to this blosoming romance, tensions have apparently been running high in the rehearsal room between Alexandra and Gorka. Despite rumours of their feud, a source associated with the pair claimed that it’s all been blown out of proportion: “This is just complete nonsense, Alex and Gorka are getting on really well – they’re definitely pushing each other in the rehearsal room to be the best they can be and create amazing routines. they said. Whilst rumours were spinning out of control surrounding Gemma and Gorka’s blossoming romance, Alexandra recently appeared on ITV’s Lorraine, to state her certainty that there’s nothing romantically occuring between her dance partner and Gemma. She said: ‘You say apparently that’s happening. I don’t know where he’s got time to have anything going on to be fair. So, with gossip seemingly put-to-bed surrounding Gemma and Gorka’s relationship, Alexandra has also admitted she’s finding it difficult to get loved-up with her dance partner during dance routines. “Every time we ran it in rehearsal I kept getting quite giggly and embarrassed by being so close to him and pretending to be in love,” she said. “We got to a point where we had to stop, and he went red-faced, but then I started tickling him and we were laughing so hard we were crying!”. A few weeks back, Alexandra hit the top of the leaderboard after receiving a huge 39/40 after dancing to Tina Turner’s ‘Proud Mary’, however many viewers of the show are wondering whether her constant high scores are ‘fixed’ due to the death of Alexandra’s mum who died just weeks before the first live show. Yet, ‘baddie’ judge Craig Revel Horwood has hit back at these claims in his column in Woman Magazine, writing that such reports of this ‘fix’ are ‘ridiculous’. #Strictly why does every one on here dislike #Alexandra Burke? There's nothing wrong with her and she's a fab dancer !! In other Strictly news, former JLS star Aston Merrigold and professional dance partner Janette Manrara were slammed by viewers after they were filmed practicing in a graveyard in preparation for Halloween week. “Aston and Janette’s pre-dance film was recorded in a cemetery as their routine on Saturday evening’s Halloween-themed show was set in a graveyard,” they said. Even judge Strictly judge Shirley Ballas has hit headlines recently after viewers were ‘disappointed’ that she has been softer on contestants than anticipated. Apparently, the 57-year old has been so ‘nice’, that viewers have complained she’s been marking contestants too highly, despite their obvious mistakes. “I have been an adjudicator all my life. People are judged against themselves and not against each other. Every journey is a different one. “In some ways I love the viewers but they’re not ballroom dancers. Some of them are and they have great constructive criticism. So how has Shirley dealt with the increased fame and criticism, especially in the “overwhelming” beginning? Strictly Come Dancing continues on Saturday at 6.50pm and the results show on Sunday at 7.15pm on BBC One.